A retail merchant account is a specific type of account reserved for businesses that accept payments from their customers in a “face-to-face” setting. So, if you have a business with a storefront where the credit card is presented at the time of sale and swiped through a card reader in order to get approval you will be eligible for a retail merchant account. Merchant services providers classify merchant accounts by the risk associated with each transaction that takes place. It is assumed that since the cardholder and the card are present at the time of sale the likelihood of a chargeback or fraudulent activity is greatly reduced. Because of this, retail merchant accounts hold the lowest risk so you will pay the lowest amount in fees. There are always multiple rates and fees associated with a merchant account so just remember that a retail merchant account will yield the lowest effective rate when comparing it to other types of merchant accounts. For example: A retail merchant account will have (on average) a lower effective rate cost than an internet or mail order merchant account. Again, the reason for this largely has to do with how the transactions are accepted at the point of sale. Retail account means low risk and thus, better rates. With most merchant accounts there are two types of pricing available. Both pricing models get confusing very quickly if it’s your first time at trying to understand the pricing of a merchant account. My advice is to slow down and don’t try to understand everything. Just focus on one thing, the effective rate. Always look at the effective rate that you pay. A merchant account provider should be able to accurately estimate this for you when signing up for a new account, and if you already have an established history with a provider you have a statement history to go back and compare. Keep in mind, that most of the time, advertised rates are only part of the entire fee package that you will pay. In general, effective rates for a retail merchant account should range from 2.00% to 3.00%. So when you see advertised rates, for example, of 0.39% or 1.59% just know that there will be other charges and more to it than the advertised rates. With each retail merchant account you will need a mechanism by which you process the cards, i.e. a credit card terminal or POS (Point Of Sale) device. But first, ask yourself a couple of basic questions to determine which type of terminal to use. Do you have the need for a special point of sale computer system/cash register? Do you have phone or internet connection available? Verifone is the biggest and best known brand when it comes to stand-alone credit card terminals for merchant accounts and in my opinion they are among the easiest terminals to operate. 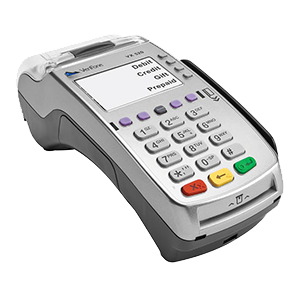 If you want to keep it simple, pick a stand-alone terminal by Verifone. These terminals will be able to handle all of the necessary functions you will need to run credit cards, process returns (if needed) and it also has the capability of sending your transactions for deposit automatically each night. Both of these terminals look very similar and perform similar functions but the VX570 has a little more memory so it can carry out multiple operations at the same time. Don’t make choosing a terminal more difficult than it needs to be. If you choose a stand-alone terminal option, go with one of the options just mentioned. You can also use a retail merchant account with a computer Point Of Sale system. So if your business has the need for a more robust cash register or POS system, then you will simply integrate your retail merchant account into the POS system instead of using a stand alone Verifone terminal. For simplicity and cost, it is easiest to use a Verfione terminal as long as it suits your business needs.